I started out early as a door-to-door salesperson. Back in the day, waaaaay before internet shopping, there was such a thing as selling stuff door-to-door. Of course there were professionals who did this, but kids did it too. I sold lots of stuff because my school sent me out to do so. I sold Catholic Christmas Seals for The Holy Childhood. I sold subscriptions to the Catholic Newspaper The Monitor. Chances are if you loved in San Francisco any time during the 1960s, I was knocking on your door. All of those things of course were with the blessings of my parents who accompanied me on my door knocking adventures. However, I really had a taste for the old doorbells, and I set out on my own little sales projects. It all started when I saw this ad on the back of my Batman Comic Book. I saw that. 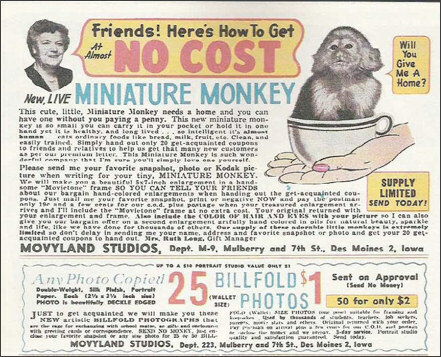 A for reals teacup monkey! I wanted that monkey bad. The way I saw it, it could sleep in my underwear drawer and no one would be the wiser. It didn't hurt that merely for sending off the form, I'd also get FREE FREE FREE a genuine magnifying glass which I could use to start fires and signal for help. I wanted that monkey bad enough to steal an envelope and stamp from my mom's drawer, fill out the form and mail it off. Of course I didn't bother with the small print which involved my selling some stuff. What stuff exactly? This stuff. 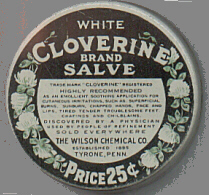 White Cloverine Brand Salve. I had no idea what it was for or did. Hell, I didn't even know what salve was. All I could think of was that monkey and the fun we'd have. Of course I never even considered the fact that I had asthma, and just being in the room with the monkey would probably kill me. After all, hadn't I already proved myself selling newspaper subscriptions and Christmas Seals? The salve (whatever it was) would be a no brainer. As it turns out this was sort of what it was. Before long, a large box was delivered to our doorstep addressed to me. Of course at the age of 8, I didn't get a hell of a lot of mail, so my parents couldn't help but notice. I tore the box open, dug around a bunch of flat tin cans, pulled out my ABSOLUTELY FREE magnifying glass, and set out to signal for help. My mom of course wondered "what the hell those cans were?". "Salve," I said, "I'm selling it to the neighbors. I'm getting a monkey. He's going to live in my underwear drawer"
Famous last words. The magnifying glass, the salve, the whole thing was packed up, taped up marked in big letters "NO SUCH PERSON AT THIS ADDRESS" and dropped off at the post office. That was the end of my door-to-door sales career. Until I joined the Girl Scouts and I found myself back in the door-to-door sales business, this time with my moms okay. Now I wasn't the handiest Girl Scout. I was a city kid. I did earn a Knot Tying Badge, but my big achievement, the only badge I really wanted was the now discontinued Story Teller Badge. Actually it was quite prescient considering I've earned my living for decades as a screenwriter. Of course the other thing I was good at was selling cookies. It was similar to situations where companies bring in hackers to check their security systems. All of a sudden I was back on peoples doorsteps, but this time in a uniform on the side of The Light. I was legit. No salve, no monkeys, just good wholesome Girl Scout Cookies. Which brings me to this recipe. I simply couldn't resist when my friend Beth's two little girls were selling their Girl Scout Cookies this year. I set myself a challenge. I would do something with the cookies besides dipping them in a cup of tea. Maybe I've been watching too much Chopped but I loved the idea of a challenge. I was determined to come up with something. Beth suggested that the best cookie for me to use would be the peanutty Do-Si Do's . I wanted to use them in an Indian flavored dish so after thinking for a bit I decided to make a crust I could use for oven fried fish which I would call "Be Prepared Fish." Scrape the filling off the sides of the cookies. Put the cookie halves in a blender or grinder and grind them into fine crumbs. Pour the crumbs into a large bowl. Pour the peanuts into a blender or grinder. Grind them into a powder and pour them into the bowl with the cookie crumbs. Mix everything together well. Taste your crumb mixture and adjust your seasonings. You may want to add more ground peanuts or chili to balance the sweetness of the cookies. Dip the fish fillets into the milk mixture . Coat them well and them dip the fillet into the crumb and spice mixture. Place the fillets on a cookie sheet sprayed with non-stick spray and put them into the preheated 425 degree oven. Bake the fish for about 20 minutes then flip them and bake on the other side for another 5 minutes or so. The fish should flake easily and still be moist. This is a matter of your oven speed, so keep an eye on it. I had planned on flipping the fish after 15 minutes but decided that because of the thickness of the fish to let it cook a bit longer. This is a matter for eyeballing. As you can imagine I was pretty curious to taste this concoction. It worked! I served the fish with Coconut Dal , tomato raita, and saag with spices. Fish rolled in Girl Scout Cookies and Indian Spices was good. Who knew? So next time the Brownies and Scouts come knocking on your door, think outside the box. Try something new. You won't be sorry. A hassle free simple fish recipe and an intelligent substitute for bread crumbs..Thanks for the idea! That is SOOOOOOOOO funny - that monkey. Oh, in your underwear drawer! Loving this creative use of Girl Scout cookies! As a woman who spent hours at a table full of these cookies this fall (really quite brilliantly placed, on a football Sunday, by some wise mother, squarely in front of the liquor store) "not selling but supporting" my little Girl Scout, I can say this is a remarkable new use for the forlorn, last-place Do-Si-Do. Thank you. 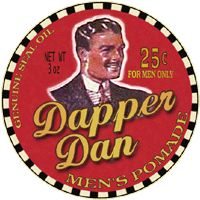 I think this generation just doesn't have the tasty monkey-memory for things (like the corollary Nutter Butters) nor any need to tie knots (untying is a different story) to pick the Do-Si-Do--alas, the Thin Mint is still maddeningly slender and victorious as ever on the GS Circuit [shakes head]. If you can find a use for those, upcycling the tastes of faux mint, dust, and badge-grasping into some new delight, please let us know. Love, love, love your blog.